Please refer to our stock # 1-0858 when inquiring. 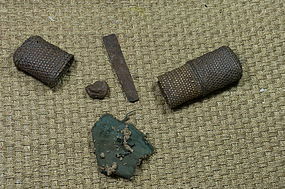 Fire lighting implement consisting of a piece of iron, pieces of fabric and a fragment of flint stone, the whole set being contained in a rattan box. This implement belonged formerly to a member of a tribe located in Palawan Island, South West of the Philipino Archipelago. Such tribe, like a few others in this island, has in some aspects remained in the Stone Age. It was put under the protection of the Philipino Government some 40 years ago. The closed box length is 7 5/8" (19,2 cm). The box has a beautiful glossy brown patina, the iron piece is strongly oxidized, the fragments of of fabric are obviously old. A very rare ethnographic piece collected in the Philippines in 1978. Rare Silver Pipe, Lawa Ethnic Group, Northern Thailand Important and Rare Mask, Laos Ritual Spoon, Indonesia, Flores Isl.